To freeze, cool completely before freezing for up to 3 months. You can warm this easy-to-make, classic bolognese through from frozen. Make up a huge batch to feed a crowd. Or freeze some for a quick mid-week meal. Use this bolognese sauce to make our delicious classic lasagne. Peel and roughly chop the onion, garlic and carrot. Wash and roughly chop the celery. In a heavy based saucepan, heat the oil and butter until it foams. Add the onion and cook for about 5 minutes. Add all the minced meat and pancetta and fry over a high heat for 5 minutes until brown all over. Use a fork to break up any clumps. Add the celery, garlic, bay leaf and carrot and cook over a medium heat for another 7 minutes. 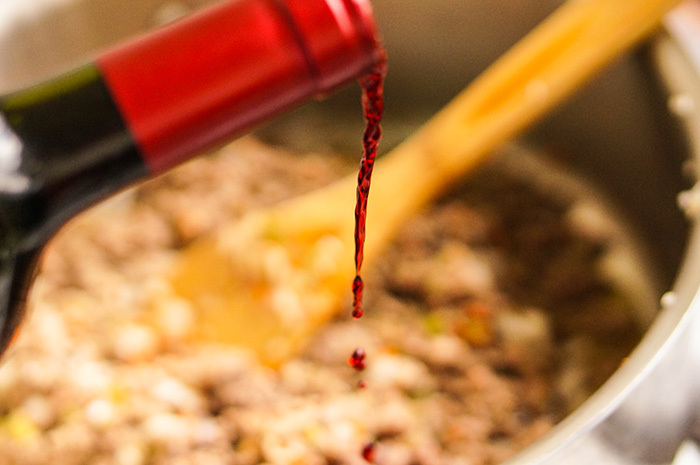 Pour the wine into the pan and cook over a high heat for a couple of minutes. Add the tomatoes. Bring the sauce to the boil and season with a generous grating of nutmeg, a pinch of salt and a good grind of black pepper. Cover the saucepan with a lid, turn the heat down to a simmer and continue cooking for an hour. If the sauce starts to dry up during cooking add 2 or 3 tablespoons of milk.